Just one year on from its launch, the Wildlife Watch/Wildlife Explorers Group based at Paxton Pits Nature Reserve has won Best New Group in the Watch Group of the Year competition run by The Wildlife Trusts. 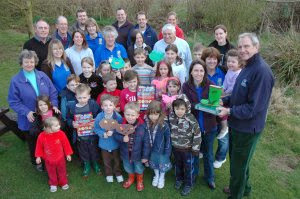 The special "Green Wellie" award was presented to the Group by Michael Allen, Chairman of the Wildlife Trusts at the Visitors' Centre, Paxton Pits Nature Reserve on Saturday 28 March. The Group's monthly meetings at the Reserve include a range of fun activities tailored to the ages and abilities of the 30+ children. Sessions last year included, bird feeding, nest-box building, pond dipping, wild songs, bug Olympics, and a mass migration – a journey that took the children from the ice fields of Scandinavia to the rich feeding grounds of Paxton Pits, all in 2 hours! The aim is for the children to go home from each session with an item in their hand, a wildlife message in their head, and a smile on their face. "The Group made good advantage of the Visitors' Centre and gorgeous surroundings, creating a programme with lots of variety and hands-on outdoor activities." Helen was also impressed by the support shown to the group. Besides help from the local Wildlife Trust for Bedfordshire, Cambridgeshire and Northamptonshire (BCN) and the Royal Society for the Protection of Birds (RSPB), the group has benefited from strong support by the Friends of Paxton Pits Nature Reserve, Huntingdonshire District Council, and Little Paxton Parish Council. The committed team of 10 volunteer leaders puts the Group's success down to the commitment and enthusiasm shown by the children and their parents, and the sheer fun and enjoyment of creating and delivering educational wildlife activities. The Group's success has resulted in a waiting list for children wanting to join in the fun. The leaders urge anyone who is interested in this kind of group, either for their children or for themselves as a leader, to contact the RSPB or Wildlife Trust BCN for details of other groups in their area.